The sanctioning body ditched its traditional albeit time-consuming single-car qualifying format for restrictor plate racing around the high-banked/2.5-mile Daytona International Speedway in favor of the “knockout” format popularized by Formula One for road-courses. A four-time Sprint Cup Series champion, Gordon kicked-off his final full season as driver by emerging from the third and final round as pole-winner via a hot lap of 44.711-seconds/201.293 mph. Gordon’s pole-winning lap was the first over 200 mph for the race since Bill Elliott rocketed around DIS at 210.364 mph in a Ford Thunderbird in 1987. “This format is crazy and chaotic,” said Gordon, driver of the No. 24 Drive to End Hunger Chevrolet SS. “It can be extremely rewarding when you have a day like we had, to bring that kind of group effort together. 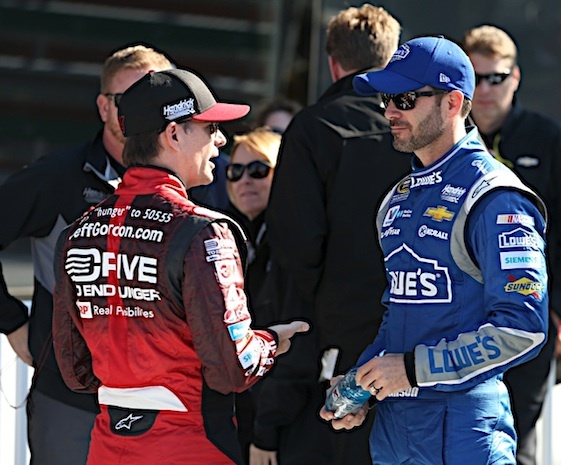 Gordon’s 78th career pole secured his starting position for the “Great American Race” on Feb. 22 alongside Hendrick Motorsports teammate Jimmie Johnson, who was a miniscule 0.035-seconds behind Sir Jeff. No Ford Fusion drivers advanced into the top-12. Three Joe Gibbs Racing Toyota Camrys followed the Hendrick Twins. Denny Hamlin finished third and in front of Matt Kenseth, winner of Saturday night’s crash-marred 75-lap Unlimited non-point race, and teammate Kyle Busch. New teammate Carl Edwards placed seventh behind Kasey Kahne in another HMS Chevrolet SS. Gordon and Johnson will start from the pole during the two 150-mile Budweiser Duel at Daytona races on Thursday night _ Gordon in the first race, Johnson in the second. The Budweiser Duels will establish positions 3-32 for the Daytona 500 starting grid. Positions 33-36 will go to the four fastest drivers from qualifying who haven’t made the field via their Budweiser Duel efforts, which already has secured Edwards a starting spot. Since Edwards is making his debut in the No. 19 ARRIS Toyota at JGR, there are no 2014 car-owner points to fall back on _ the criteria to fill positions 37-42 for the Daytona 500. If Edwards hadn’t qualified well, he would have been forced to rely upon his Budweiser Duel-race finish to make the field. Four five-minute segments were conducted Sunday, with the field split in two for the opener. The fastest 24 cars on combined times advanced into Round 2, with the top-12 moving into the pole shootout in Round 3. The opening segment was marred by a crash that destroyed several cars and left Clint Bowyer irate. That set the tone for the remaining sessions, during which the cars were pushed away from the pit wall only to sit idle in their tracks or slowly maneuver to find a suitable drafting partner before heading on-track for what amounted to one trouble-free flying lap. “That worked out exactly as I thought it would,” said Hamlin, driver of the No. 11 FedEx Express Toyota. “I was trying to back-up to zero-time; I wanted to be the last one to cross the line so I had points on the racetrack that I knew I needed to be at and I tried to back-up to the 24 (Gordon) and 48 (Johnson) to where they would miss it, but with the draft it picked up the speed and I allowed them to cross the line before it went zero. Bowyer’s day was anything but after his Michael Waltrip Racing Toyota was reduced to scrap in the opening segment pileup triggered by contact with Reed Sorenson’s Team Xtreme Ford. Bowyer criticized Sorenson for his banzai pass for position but saved the brunt of his criticism for the sanctioning body. The format did produce arguably the most elite front row in race history. Gordon and Johnson have won 10 Cup Series championships between them _ Gordon four/Johnson six _ and five Daytona 500 titles _ Gordon three/Johnson two. “Man, it’s tough because I think everybody’s trying to keep an open mind on what’s best for the sport, what creates the most interest,” said Johnson, driver of the No. 48 Lowe’s Chevrolet SS. “I guess maybe we should look at viewership numbers and attendance numbers to see if this format supports the risks that the teams are taking, drivers are taking in the cars. The Budweiser Duel at Daytona will air from 7-10 p.m. (EST) Thursday on FoxSports1. “I don’t know what the right thing is,” said Johnson, who completed the fourth front row sweep for HMS in the Daytona 500. “Fortunately, I drive for a big team, a well-funded team. I would be bummed if we lost our 500 car, but we have good backups. Maybe I don’t have the best point of view on it. Trying to do what’s right for the sport. That’s why I go back to stats. Not trying to take a soft way out. Steve O’ Donnell, NASCAR’s executive vice president, said in a post-qualifying press conference that series officials would seek-out “feedback from the industry” over the group format at DIS. That would include TV partner Fox Sports, which will conduct a conference call with media Tuesday afternoon with a lineup featuring Eric Shanks, Fox Sports president/COO, and John Entz, Fox Sports executive producer.